"The guide to creation and management of mountain-skiing complexes in Russia"
Lack of special periodic literature on methodical approach to the solution of the tasks arising in the sphere of construction and operation of Ski Resorts led to the "Guides to Creation and Management of Ski Centres of Russia" edition (further "Management"). Publishers hope that this "Management" will help heads and investors of GLK to optimize financial and time expenditure, to increase overall performance of GLK, to accelerate process of payback and to maximize profit. • Equipment for service of mountain-skiing routes. • Engineering constructions and communications. Recommendations about design and construction of systems of water treatment and water supply, sewerage and treatment facilities, power supply systems. • Payment and throughput system. • Illumination of mountain-skiing routes. • System of scoring of mountain-skiing slopes. • Medical aid station. Organization of system of hire and service of a sports equipment. Recommendations about the organization of points of a food. Advance and development of mountain-skiing complexes. The following release of "Management" No. (4) is planned in the 3rd quarter 2014. We invite experts of the mountain-skiing industry to share experience in construction and GLK operation. Address post mailing: on mountain-skiing complexes (300 addresses) and sports committees of regions of the Russian Federation. Regions: Moscow, Leningrad, Lipetsk, Murmansk, Pskov, Tambov, Chelyabinsk, Vladimir, Nizhny Novgorod, Irkutsk, Sakhalin, Kamchatka, Orenburg, Samara, Saratov, Perm, Chelyabinsk, Sverdlovsk, to areas, Altai territory: Belokurikha, Kemerovo region, Krasnoyarsk Krai, Khanty-Mansi A.O. ,Yamal-Nenets A.O.,Respubliki: North Ossetia, Tatarstan, Adygea, Bashkiria, Ingushetia, Karachay-Cherkessia, Kabardino-Balkaria, Dagestan. Further distribution on a subscription. - The international Conference of a name of A.N.Kovalev "Practical questions of operation of mountain-skiing complexes" - the Leningrad Region. "Management" leaves once a year. Circulation is 999 copies. 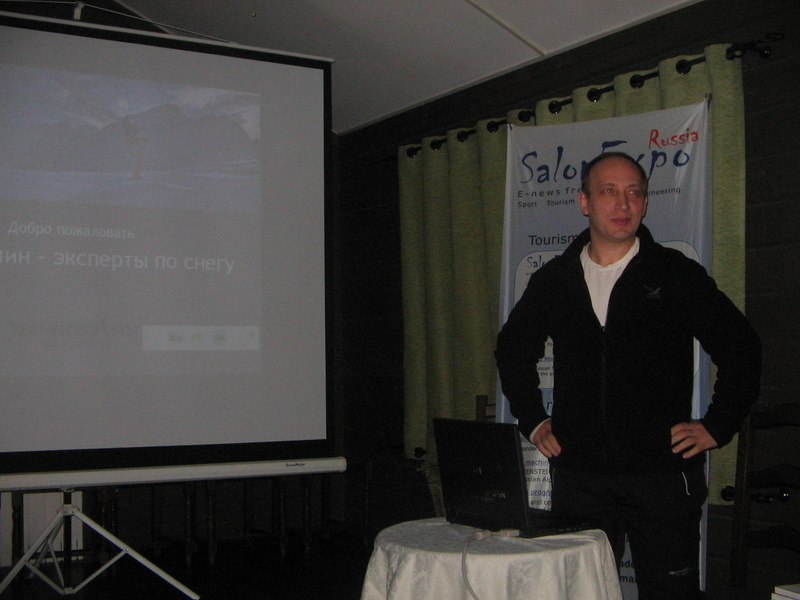 Author of idea: Petrov B. V. – the head of NP "Meeting of Ski Centres of Russia"
Editor-in-chief: Golikova I.N. 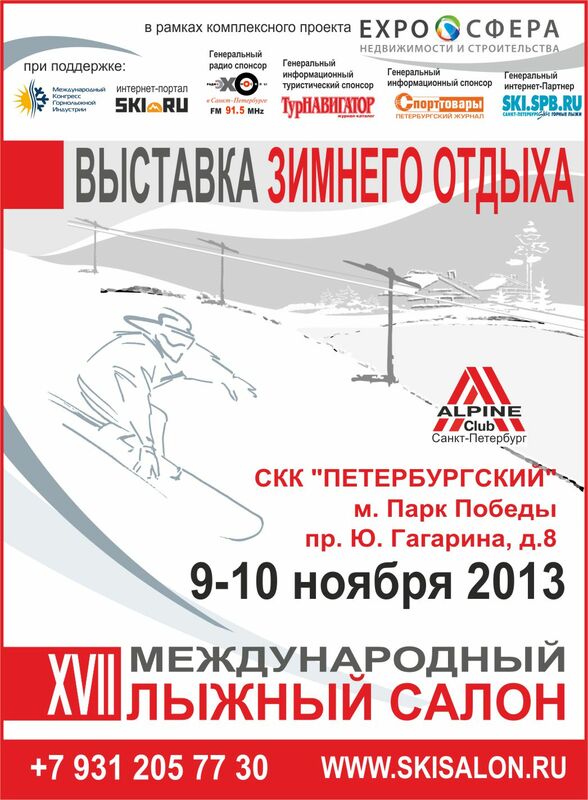 president of "the Alpine Club"
WELCOME to St.Petersburg , exhibition-sale 16-th "SKISALON" 20-21 of October 2012y. International Conference of a memory A.N.Kovalyova «Practical questions of operation of mountain-skiing complexes». On January, 16-19th 2012y. in Leningrad region on the mountain-skiing center «Zolotaia Dolina» there has passed the International Conference of a name of A.N.Kovalyova «Practical questions of operation of mountain-skiing complexes». 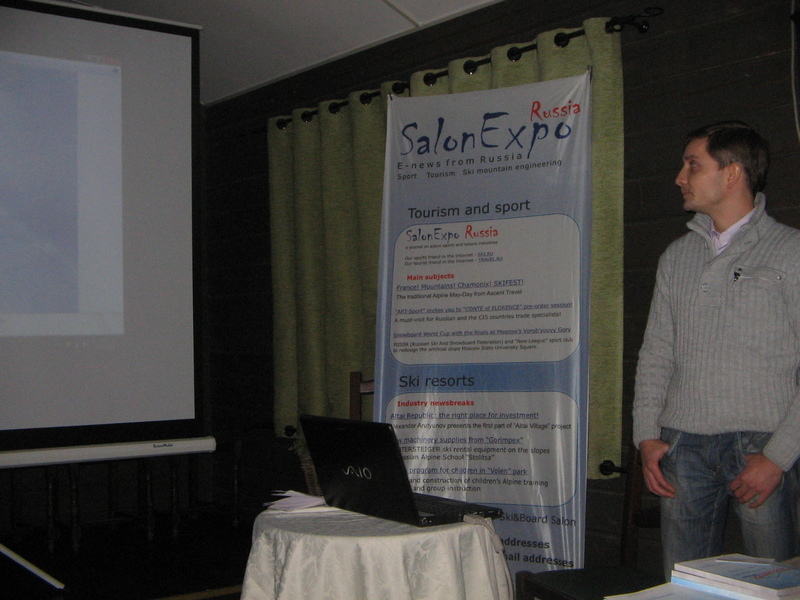 As the organizer of Conference company "Ski-Resort-Konsalt" has acted. In Conference have taken part more than 100 experts of mountain-skiing business and about 30 representatives of mass media. 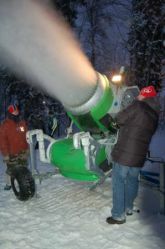 Snow guns – Bachler Sno Tek NESSY (Switzerland), SMI Viking V2 (USA). Among participants of conference there were representatives of companies "Ratrak-services" (Moscow), Supersnow (Poland), TPS (Austria), "GorTehTsentr" (Moscow), «SKADO» and "SKADO-TECHNO" (Samara), SMI (USA), Pisten-Bully (Germany), Bachler (Switzerland), Lenko Russia (St.-Petersburg), ISD (Moscow), AP-SERVICE (St.-Petersburg), "SportPromStroj" (Moscow), PSK "Omega" (St.-Petersburg), representatives of "the Union of the Mountain-skiing Industry of Russia», NK «Meeting of the mountain-skiing centers of Russia», Federations of Freestyle of Russia, Rostehnadzora, delegation from "Organizing committee" of Sochi-2014 », representatives of Department on tourism of Yamal-Nenets autonomous region (Salekhard), the representative of the State Committee on republic Bashkortostan tourism, the representative of the French region Rhone-Alpes, and also representatives from 40 mountain-skiing centers from all regions of Russia:« Zolotaia Dolina "," Snejni "," Krasnoe Ozero "," Igora "," Tuutari park »(Leningrad region),« Bolshoi Vudjavr »(Kirovsk),"KolaSportLend"(Kirovsk),« the Krasnie Holmi »(Kovrov), sport Park" Volen "(Moscow Region),« Chornaia Gora» (Ivanovo), "Cometa"(Vladivostok),"Edelweiss"(Petropavlovsk-Kamchatskij),«GLK»(Samara),"Uktus"(Ekaterinburg),«Krasni Kluech »(Ufa), "Manzherok"(Republic Altai),« the Malskaia Dolina »(Pskov),«Zaiachia Gorka » (Vladimir),"Ryder"(Miass),"Puzhalova Gora"(Vladimir region),"Nechkino"(Izhevsk),« Sobolinaia Gora »(Baikalsk),« Hvoini Urman »(Khanty-Mansiysk),"Habarskoe"(Nizhni Novgorod), Gora Belaia (Nizhni Tagil),"Kalinka-Morozov"(Kirov) and many other things. Elena Kovalyova, Boris Petrov and SVictor Timakov have opened conference With a salutatory word to participants of Conference from the president of Association of ski sports of Russia Andrey Bokareva Elena Gitina has acted the secretary general of Federation of Freestyle of Russia. One of the most important problems for modern Ski resorts is artificial snowing. Thus snow guns are not less important component ski resorts, than rope-ways. Artificial snow allows to begin a mountain-skiing season in the autumn and to prolong it till May, thus fans of mountain skis and a snowboard have possibility to be engaged in a favorite sport six months in a year. 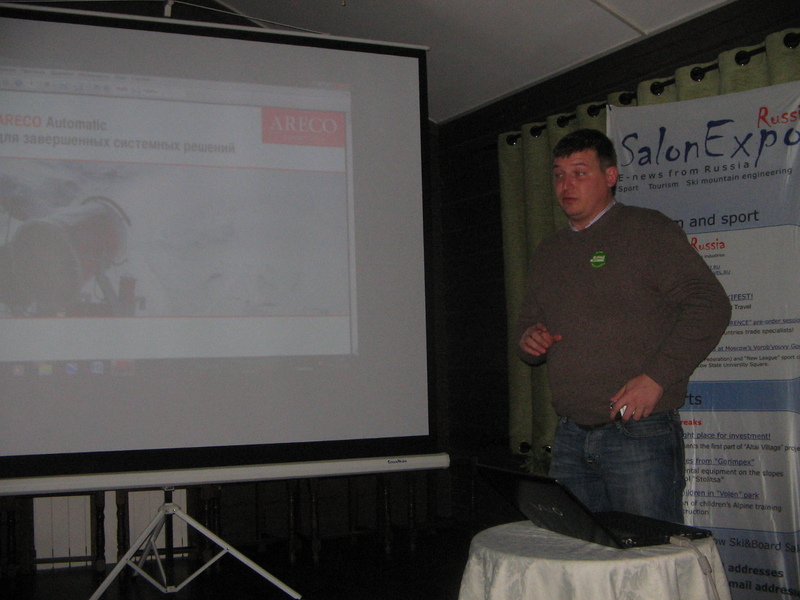 With presentation of the equipment heads of the Russian representations of firms-manufacturers snow guns – Areco (Sweden), Bachler (Switzerland), Demac (Austria), Lenko (Sweden), SMI (USA), Supersnow (Poland), TPS (Austria) have acted. Leading experts of campaigns «SKADO» (Doppelmayer) and "AP-SERVICE" (Leitner) have imparted experience designing, building and operation of rope-ways. Representatives of "Rostehnadzora" and the expert organization of Joint-Stock Company "Stek" have told about control over a technical condition of rope-ways and have answered numerous questions of participants of conference – representatives Ski resorts. The questions, concerning works Ski Resorts in summertime and in inter-season period have been taken up. The chief of department of programs of development of tourism of the State Committee has told about development Ski resorts and creation on its base of an all-the-year-round mountain-tourist complex on State Customs Committee "Nuguesh" example on republic Bashkortostan Ruslan Valeev tourism. The general director of company "Ski-Resort-Konsalt" has told about ways of increase of profitability Ski Resorts and about their effective management, and also about the organizations and carrying out of sports competitions to reception of the maximum economic gain. With the big interest participants of conference have apprehended performance of the secretary general of Federation of Freestyle of Russia Elenas Gitinoj about existing position of freestyle, its development on Russian Ski Resorts and prospects of this sport on the forthcoming Olympic Games in Sochi. Last day conferences «the round table» for discussion of questions of catering services on mountain-skiing complexes (restaurants, fast food, a catering) on which experts of "Ski-Resort-Konsalt" have acted has been organized. Participants of conference have examined an infrastructure of mountain-skiing complexes «Zolotaia Dolina», "Snegny", «Krasnoe Ozero» and "Igora". For three days of active and effective work many ideas on development and increase of level of the Russian mounting skiing resorts have been stated. Participants of conference comemorate the former general director of the mountain-skiing center «Zolotaia Dolina» of A.N.Kovaleva, as one of "pioneers" of mountain-skiing business in Russia. All visitors, including foreign experts, have highly appreciated the given possibility alive to discuss actual problems, to receive the information from primary sources, and also the importance of tests snow guns for development of the mountain-skiing industry in Russia. The following International Conference of a name of A.N.Kovaleva will take place in second half of January, 2013. XVI ЛЫЖНЫЙ САЛОН ВЫСТАВКА ТУРИСТИЧЕСКИХ ПУТЕВОК, СПОРТИВНЫХ ТОВАРОВ И УСЛУГ 20-21 окт. 2012г. WELCOME to St.Petrsburg , exhibition-sale 16-th "SKISLON" 20-21 of October 2012y. Restaurant "Moscow" in hotel "Moscow", an input from Sinopskaya emb. The general information sponsor: magazine "Sport goods"
RESERVE ROUNDS DIRECTLY AT THE EXHIBITION! On October, 15-16th befor a winter season «the Alpine club» invites extremely rest – mountain skis and a snowboard to an anniversary exhibition-sale «15 International Ski Salon». 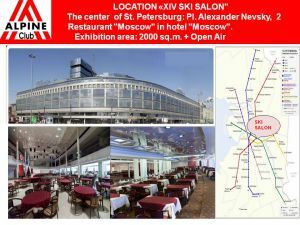 Winter season is over and we are begun to work an exhibition 15th Ski Salon in St.-Petersburg. On October, 15-16th 2011г. 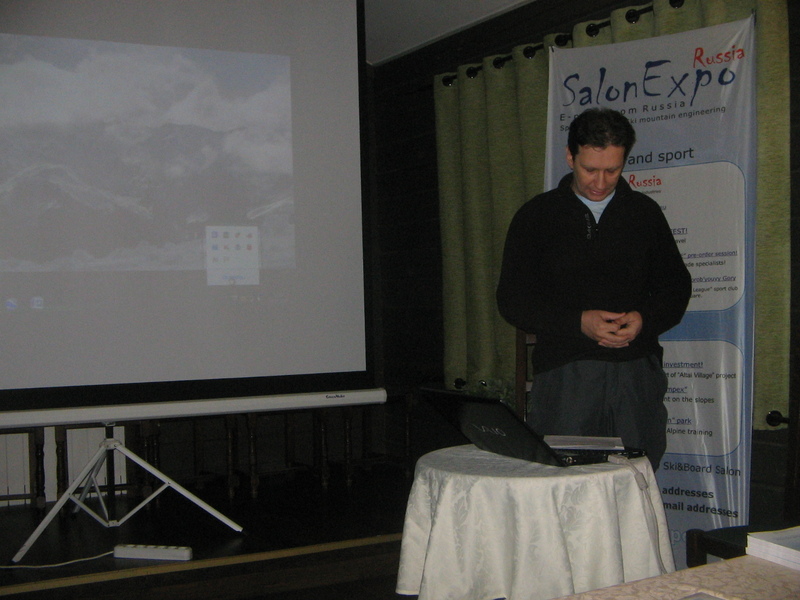 There will pass an anniversary exhibition 15th Ski Salon in St.-Petersburg. Partners from a resort of Meribel , "VisitSweden" and touroperators "InterHome", “Versa” and other have already confirmed participation in an exhibition . 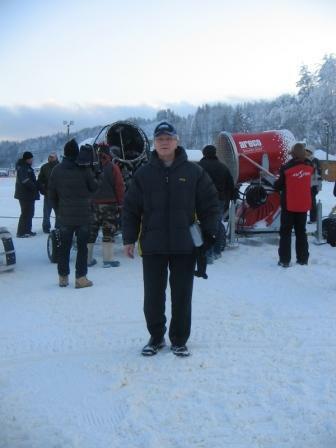 For the first time in Russia joint testing of snow machines of the basic world manufacturers. 10 years experience of system artificial snow making has shared with "Ski-Resort Konsalt" which has prepared his the chief engineer. Afternoon has been started test for snow machines. Tests passed in heavy conditions for them, air temperature has risen with-40 C during start, to-10 C by the time of the finish test, till 12-00 next day. Nevertheless, the majority snow machines has shown the ability to make artificial snow at the temperature-1o C. Besides, company "GorTehCentr" has presented on test new model of a snow gun "Bachler" which also has shown the working capacity at such high temperatures. Besides a quantity indicator of the made artificial snow, its quality, and such important indicators as quantity consumed the electric power and sound were estimated also. Participants of a seminar have inspected an infrastructure of mounting skiing resorts “Zolotaya Dolina” (the Gold valley), "Snegny”(Snow) and «Krasnoe Ozero(Red Lake), and upon termination of a seminar, the part of participants has visited a mounting skiing resort of the European level "Igora". Everywhere there was a hearty welcome and useful dialogue with experts. 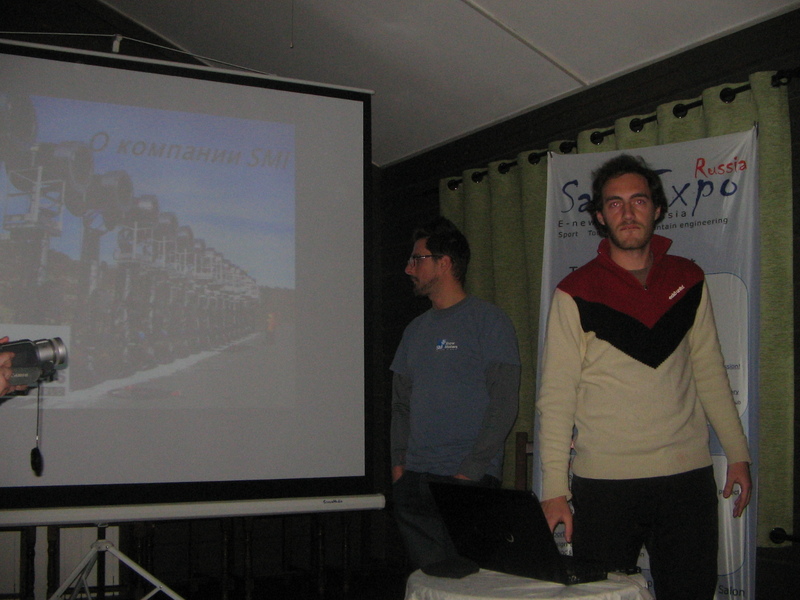 In the end of the first day of a seminar and after summarizing of test of the second day, there was a live dialogue of representatives of firms-manufacturers of snow machines, "Ski-Resort-Konsalt" and mounting skiing resorts from various corners of Russia. The last have received answers to many questions how correctly to do snow in various weather conditions of our huge country, and also could be defined, what snow machines approach for them more. For two days of active and effective work many ideas about the further carrying out of similar actions for the purpose of development and to increase of level of the Russian mounting skiing resorts have been stated. Participants of a meeting memory of former general director “Zolotaya Dolina” (the Gold valley) A.N.Kovaleva, as one of "pioneers" of mountain-skiing business in Russia. He was the big enthusiast and expert for prepare artificial snow on mounting skiing resort “Zolotaya Dolina” (the Gold valley), and thanks for him, it first began work in Leningrad region!!! Organizers of a seminar have made decision to immortalize Alexander Nikolaevicha Kovaleva's who has enclosed the big contribution to development of the mountain-skiing industry of Russia , and to hold further seminars under his name. Participants of action have highly appreciated results and have agreed that such meetings become regular — now professional snowmen will meet in January, 2012, in Bitter cold to carry out tests at temperature from -15 0 C till -20 0 C.
Now the program of a seminar which will pass in June 2011года in St.-Petersburg in the white nights prepares. 14:10 Coffee break, Visiting ski resort "Golden Valley" Visiting the ski resort "SNEGNY"
* 11:00 Ski resort "Igora" the most expensive and luxurious ski-resort of Leningrad region. 13:00 Coffee Break Visiting ski-resort, the ICE-PALACE, SPA-complex, restaurant, hotel industry. The price includes accommodation, meals, transfers for the program. The program may be change.